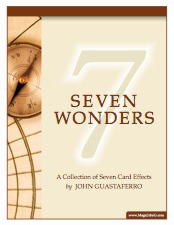 SEVEN WONDERS: An all-new collection of magic from John Guastaferro with 7 professional card effects, plus a bonus routine. In this PDF download, you’ll discover: (1) a mystery card effect, (2) a mathematical principle with a commercial kick, (3) a card fusion inside the card box, (4) an in-the-hands worker, (5) a semi-automatic effect with a kicker, (6) a packet effect featuring a new count/display, and (7) a one-degree update to one of my favorite closers. There’s also a bonus routine that features a move that Michael Vincent kindly said could open up some new possibilities with mental card magic. All seven effects include video links so you can see them in action. 1. GPS – An odd-backed card with a compass drawn on the back turns out to be the spectator’s signed selection. 3. Fusion Box – A signed card vanishes and reappears inside the box. Not only that, it’s fused together with another signed card. 4. Flip Side – A strolling worker! A selected card vanishes and reappears upside down at a number named by the spectator. 5. All Four One – This nearly hands-off effect features John’s Over Easy procedure. The spectator fairly eliminates all but one card to complete his four of a kind. As a kicker, the four-of-a-kind changes into four Aces. 6. Love Me Not – In a game of “Loves Me, Loves Me Not,” four Jokers change into four Queens. John’s new Petal Count Display is very fooling, yet very easy. 7. Gemini Squared – Ten years have passed since John released Gemini Prediction. This new update to the effect is well worth the wait. It has all the power of the original with none of the moves. After two spectators freely place four business cards in the deck, the business cards have predictions written on the back that match the four random cards. And that’s only the beginning! Mix & Match – This two-phase routine features Mixed Personality, a fun opening shuffle demo; and Proximity Peek Control, a move that allows you to reveal both the identity and location of a selected card after four people shuffle the deck.